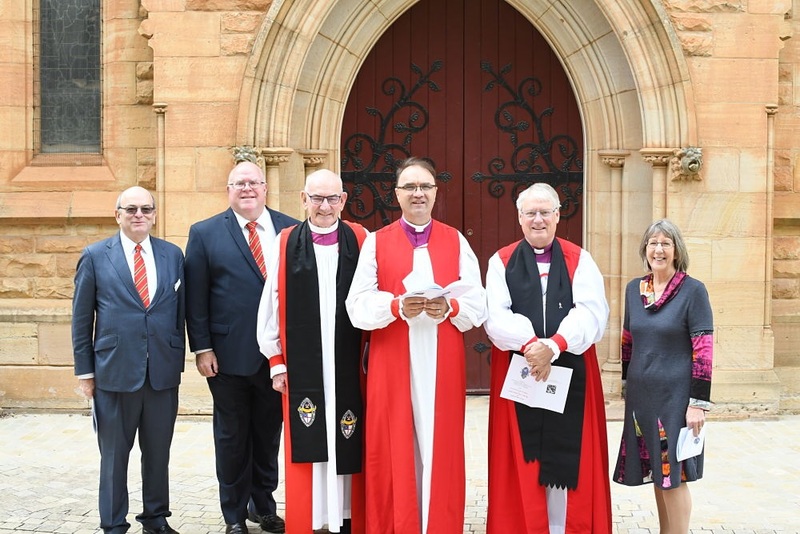 On a splendid Autumn day in Goulburn the Diocese celebrated the consecration and installation of the Reverend Dr Mark Short as its 11th Diocesan Bishop in a service at St Saviour’s Cathedral. Long, bright robed lines formed outside in the sun before the service began with a procession of theological students of the Diocese, local and visiting clergy, Canons, Deans, Archdeacons, Bishops and Archbishops into the Cathedral, where 1200 guests from around the Diocese and the country gathered to welcome the new Bishop. The Bishop-Elect proceeded to the Great West Door, where representatives from The Bush Church Aid Society, Chair of the Board Fred Chilton, Chief Operating Officer Greg Bridge and Helena Painting from Bookham Community Church, together with the presenting Bishops The Right Reverends David Robinson and Ray Smith, presented him to the Dean of the Cathedral, the Very Reverend Phillip Saunders, who greeted the Bishop-Elect on behalf of the Diocese. The Metropolitan and Archbishop, the Most Reverend Dr Glenn Davies, then lead the service. Indigenous Ministry Officer for Bush Church Aid, The Reverend Neville Naden, began his sermon by saying that while one group was celebrating, the Bush Church Aid Society was grieving the loss of such a fine leader, before preaching from Ezekiel Chapter 34, entertaining and encouraging the congregation with stories that reminded those gathered of the character of a good shepherd and the promise that God himself will be the shepherd of his people: will care for his sheep, rescue them, provide for them, feed them good pasture and bind up their wounds. The Oaths and Declarations were said before the Metropolitan, after which 21 Bishops from around the country, including the Primate of Australia, Philip Freier, and Archbishop of Brisbane, Phillip Aspinall, laid hands on the Bishop while Archbishop Glenn Davies said the blessing and prayer. Saying the Oaths before the Metropolitan and Archbishop, The Most Reverend Dr Glenn Davies. Archbishop Davies presented Mark with the Scriptures, saying ‘take them for your rule, and declare them to the world’. Sons Andrew and Matthew Short presented the Pectoral Cross, which once belonged to former Diocesan Bishop, The Right Reverend Cecil Warren, with a reminder that ‘he whom you serve reconciled us by his blood’. The Episcopal ring was presented by former Assistant Bishop of the Diocese Genieve Blackwell. Ms Giselle Burningham presented the Cope and Mitre and Mr Raymond Howes the Episcopal Staff. 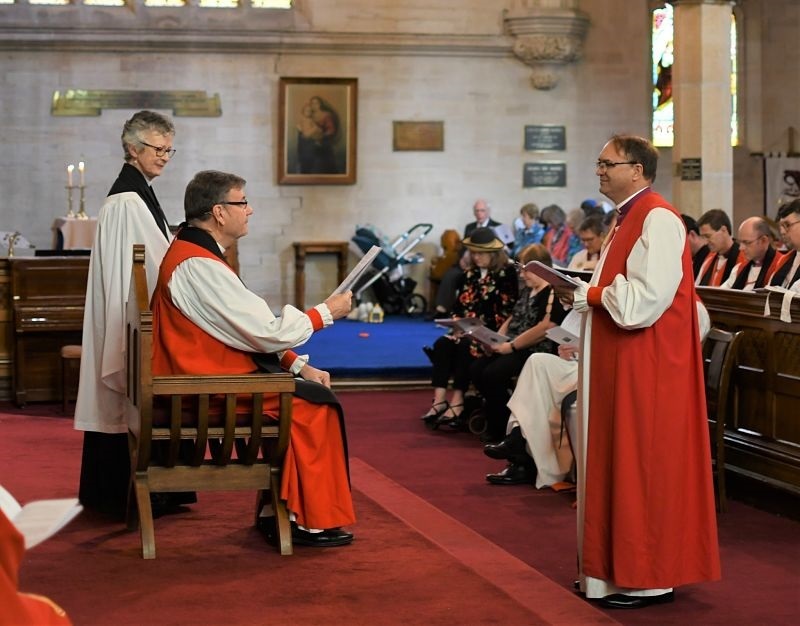 The Dean then led the Bishop-Elect to his Cathedral seat, where Bishop Trevor, as Diocesan Administrator, inducted Mark into the possession of the See of Canberra and Goulburn and presented him with the Diocesan Pastoral Staff. 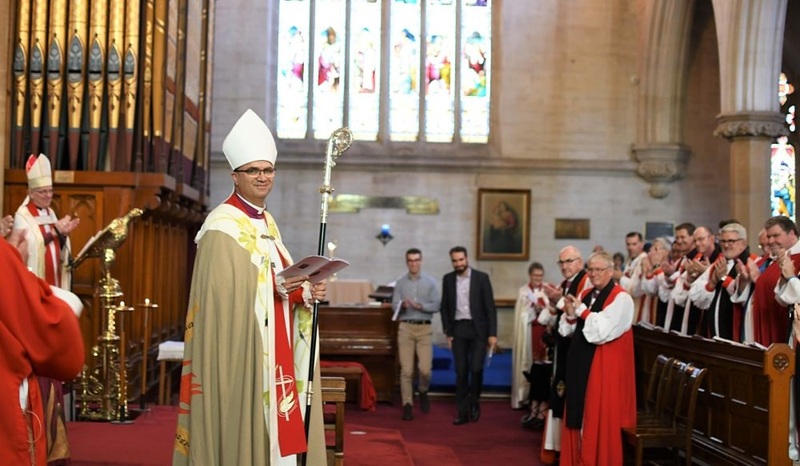 The Metropolitan said the recognition and Bishop Mark was then presented to the congregation by Bishop Trevor, now returning to the post of Vicar-General. Mayor of Goulburn Mulwaree, Bob Kirk, welcomed the Bishop on behalf of residents of the local area and Senator for the ACT, the Honourable Zed Seselja, welcomed him on behalf of the Federal Government. Catholic Archbishop Christopher Prowse gave a welcome on behalf of the heads of other churches and religious bodies, leading in the great prayer from Ephesians 3. Mr Mark Le Couteur and Archdeacon Caroline Campbell welcomed him on behalf of all the lay people and clergy of the Diocese. The new Bishop has expressed that he is honoured and humbled that the Diocese has called him to serve alongside them in this way and excited about the opportunity. He plans to approach the new role in three ways: being open to the needs and opportunities within communities; listening to people’s questions about faith; and being attentive to what it means to be a follower of Jesus. The service was followed by a sunny picnic in the Cathedral grounds, which was enjoyed by a large crowd of guests and parishioners from around the Diocese.